The call to. . . gold! The Minaret Floor and Table Lamps from Currey & Company are great works of naturalistic design with rich cultural allusions in gold. With a name that refers to the iconic slender towers surrounding a mosque from which the muezzin calls people to prayer, the Minaret lamp similarly seems to call spectators to gaze at its wild form. The Minaret lamps are an example of modern design that grows from a natural instinct as well. The wrought iron stems of the lamps recall illustrations of Mediterranean plants on ancient Minoan frescoes, resembling a kind of Southern European or North African flora. Finished in a rich Dutch Gold, the Minaret lamps are an example of a naturalistic, as well as, cosmopolitan impulse. 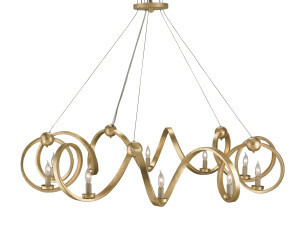 Playing to the same tune, the Ringmaster Chandelier is another Currey & Company favorite finished in a majestic golden tone. Gold Leaf is applied to the graceful wrought iron curves of the chandelier lending a royal touch to the natural simplicity and modern whimsy of its frame. 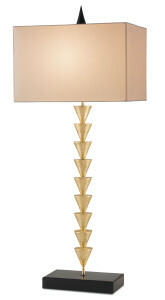 This entry was posted in Currey & Company, Products and tagged Chandeliers, floor lamps, Gold, Lighting, Mid-Century, Modern, Table Lamp on December 17, 2013 by Currey & Company.